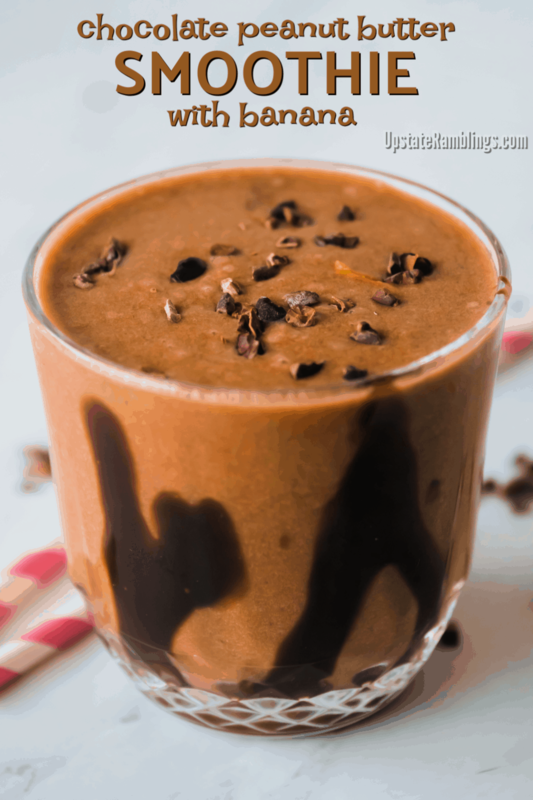 This healthy chocolate peanut butter smoothie with banana has only four ingredients, takes less than 5 minutes to make and is a decadent vegan creamy chocolate smoothie perfect for breakfast or a snack. Chocolate and peanut butter are one of the best flavor combinations imaginable. There is reason Reese’s peanut butter cups always come out on top in surveys of favorite candy. The combination of rich chocolate with creamy peanut butter is even better than either flavor is by itself! 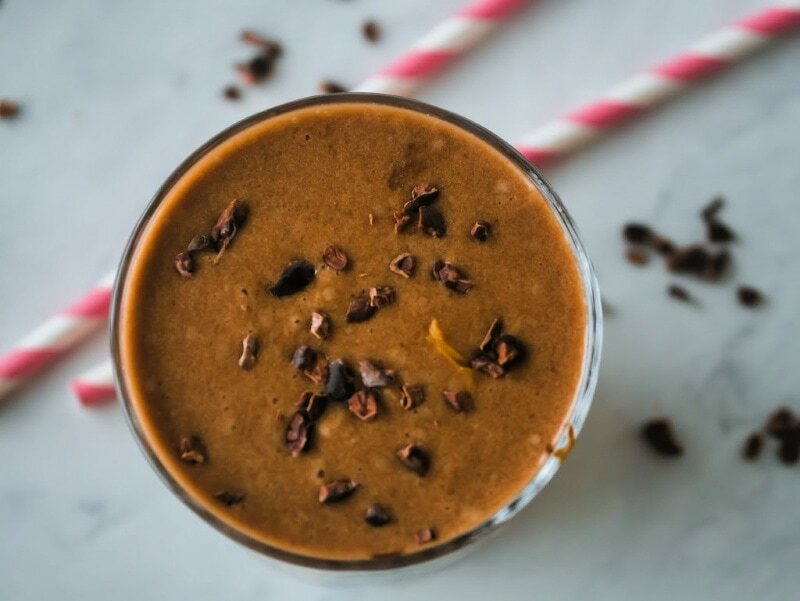 This smoothie recipe gives you a way to enjoy the amazing combination of chocolate and peanut butter, without the guilt you’d get from eating candy. 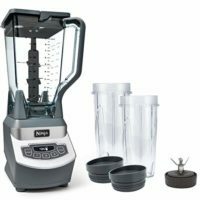 I like to make smoothies because they are a quick and easy snack or light meal that feels indulgent but is isn’t really bad for you. 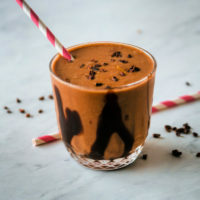 This smoothie tastes like creamy and chocolaty like a milkshake, but it has less than 300 calories and about 8 grams of protein. It fills me up and also satisfies me when I am craving something sweet. One of things I especially like about this smoothie recipe is that is uses so few ingredients and the ones it uses are ingredients I almost always have on hand. A recipe like my Strawberry Avocado smoothie is delicious, but making it requires that I have a ripe avocado in my refrigerator. 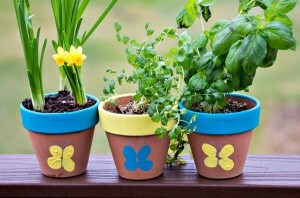 This means I have to plan ahead and I can’t just whip up the smoothie on a whim. Planning ahead is not always my strong point and ripe avocados are iffy in upstate New York in the winter. Actually ripe avocados are iffy around here all the time, but even more so in the winter! That is everything, except ice which I don’t count. No yogurt, no honey, no sweetener. 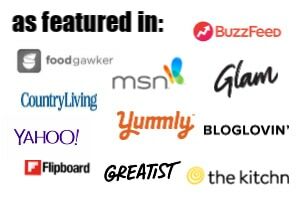 All of those are things I have on hand all the time. 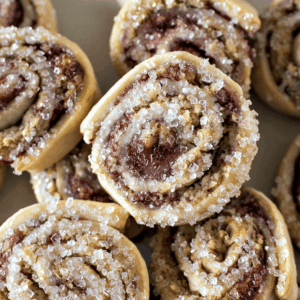 This recipe is also pretty forgiving of overripe bananas. 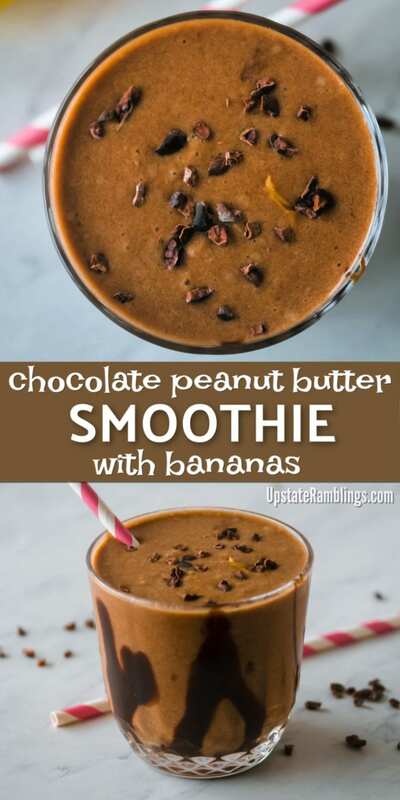 The banana is what gives the smoothie its creamy texture, but the taste of the banana is overwhelmed by the chocolate and peanut butter. So even if your banana is soft and should have been eaten two days ago you can still use it in this smoothie. I don’t think this chocolate peanut butter smoothie with banana needs any extra sweetener. 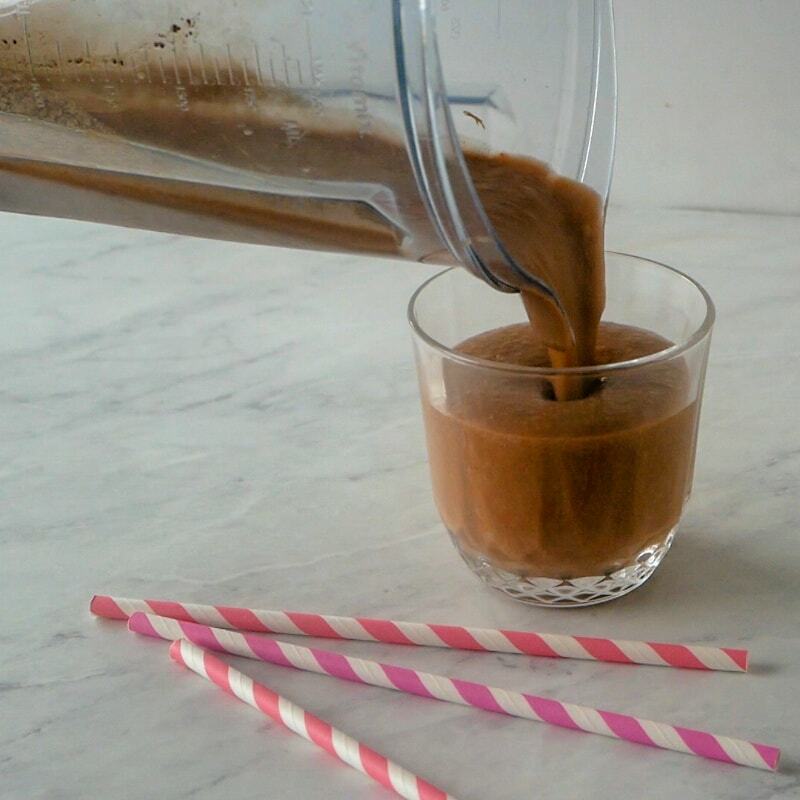 I use unsweetened almond milk and unsweetened cocoa powder, but the peanut butter I use does have a little bit of sugar added and between that and the banana this smoothie is sweet enough for me. Maybe if you like your smoothies extra sweet you will want to add honey or another sweetener, but try it without any extra first. This smoothie is all about the peanut butter banana flavor combination, not sweetness. Should I use Frozen or Unfrozen Bananas? 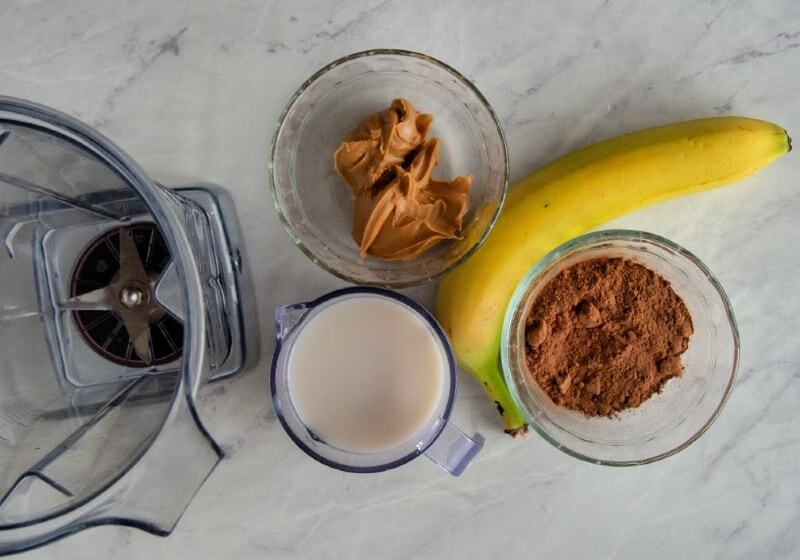 Either frozen or unfrozen bananas work in this smoothie recipe. Frozen bananas will make the smoothie a little thicker and more creamy. So if you want a smoothie with milkshake like thickness – frozen bananas are the way to go. Frozen bananas also taking planning ahead. I actually have frozen bananas in my freezer but if I want a quick snack and there are bananas sitting on my counter I am not going to bother digging through my freezer. But if your freezer is better organized than mine and you do use frozen bananas reduce the ice to 1/2 a cup. There isn’t much to say about making this smoothie – it is the definition of easy! Just put the ingredients in the blender, blend it all up and you are done. 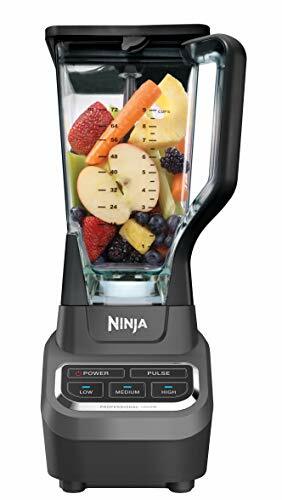 It makes cleanup easier if you keep the peanut butter off the sides of blender when you put the ingredients in. 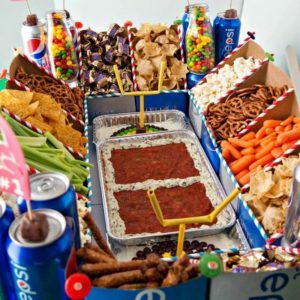 Otherwise the peanut butter sticks to the sides and will be a pain to get off. None of the ingredients in this recipe are particularly difficult to blend, so this recipe works well even if you don’t have a super fancy expensive blender. Add more milk to make the smoothie thinner. If you want more chocolate flavor or more peanut butter flavor add more of one those to tip the balance towards your favorite. 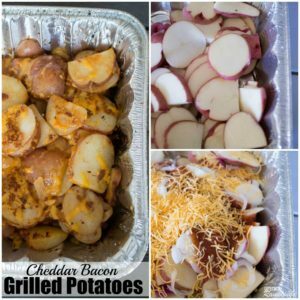 Adding protein powder can make this recipe a more substantial meal replacement. 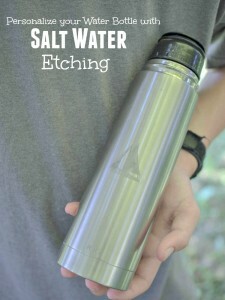 Change up the flavor and use almond butter or cashew butter instead of peanut butter. 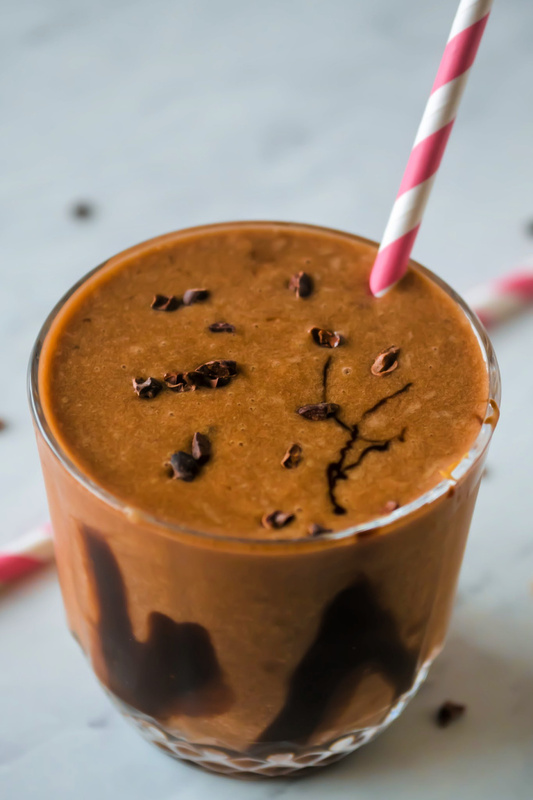 The finished smoothie is a delicious balance of flavors and you can feel good about indulging in the creamy chocolate smoothie. I topped this smoothie off with a drizzle of vegan chocolate syrup and a sprinkle of cacao nibs, which make it even better, although not quite as healthy. 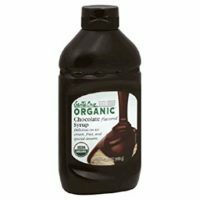 I don’t usually add chocolate syrup but I really like to add a sprinkling of cacoa nibs. 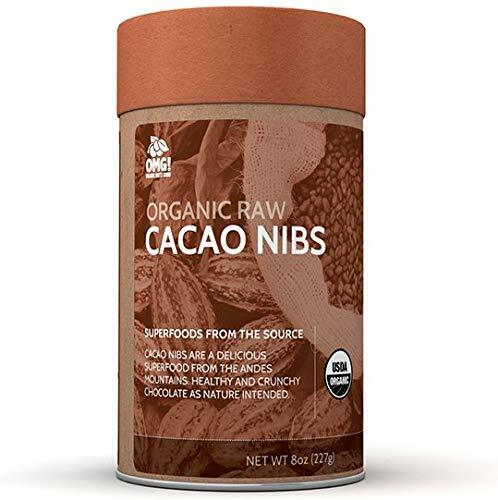 The crunchy flavor of the cacoa nibs makes a nice contrast to the creamy smoothie. 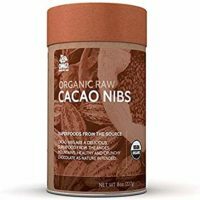 Chocolate chips would have the same effect, but cacoa nibs are naturally vegan and not as sweet. Let me know what your favorite chocolate peanut butter indulgence is! 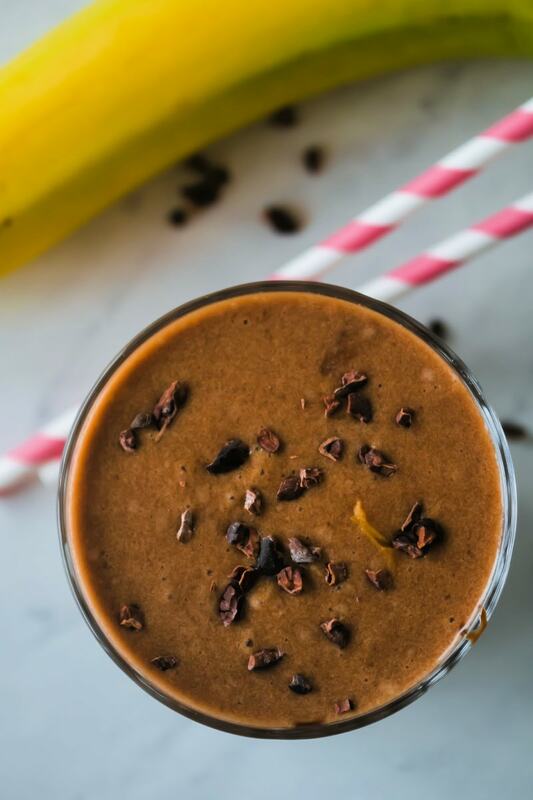 This chocolate peanut butter smoothie with banana has only four ingredients and takes 5 minutes to make.